The Holy Thorn, from the Crown of Thorns worn by Christ before and during the Crucifixion (Matt. 27:29), was a celebrated relic during the Middle Ages. 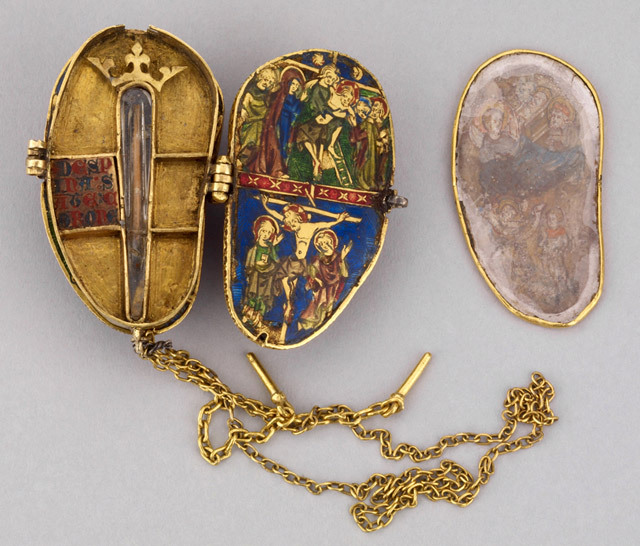 The thorn in this reliquary may have come from the Crown of Thorns that was purchased by King Louis IX of France (St. Louis) in 1238 from the Latin Emperor of the Kingdom of Jerusalem, Baldwin II. Consecrated in 1248, the Saint-Chapelle was built to store the crown itself. Louis detached the thorns from the main band and sent many in reliquaries as gifts. This practice continued under successor kings. The outer cover of this pendant is backed with amethyst. The interior is enameled using a technique known as basse-taille, in which shallow wells are cut for the enamel. The enamel is laid in such thin sheets that it is translucent and the metal shines through; this differs from the champlevé technique where the enamel is opaque. 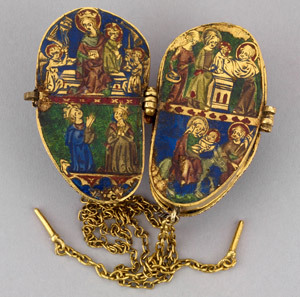 The pendant is composed of three leaves, each divided into two registers, that depict scenes from the life of Christ: the Nativity, the Annunciation to the Shepherds, the Presentation in the Temple, the Flight into Egypt, the Virgin and Child enthroned, the Crucifixion, and the Descent from the Cross. The lower register of the first leaf shows a secular scene: a queen with a barefoot kneeling king, who look up toward the sacred scene above them, their hands pressed together in prayer. The presumed date of the object and its Parisian manufacture suggest that the scene depicts the French king Philip VI and his wife, Jeanne de Bourgogne. The central leaf showing the Nativity and Annunciation to the Shepherds is a painted piece of vellum covered by rock crystal (imitating enamelwork) that conceals the relic of the Holy Thorn, topped with a small gold crown.